Tom Brady's appeal of his four-game suspension lasted more than 10 hours Tuesday, ending in the early evening. The sight of Commissioner Roger Goodell leaving the league offices after he heard Brady and representatives from the players' union during the lengthy meeting, confirmed its conclusion. League security said Brady also had left. "I think we put in a very compelling case," Kessler said, adding that no timetable on a decision by Goodell had been given. 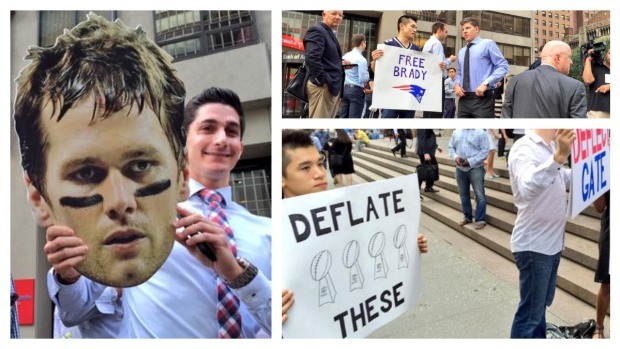 While Goodell was hearing a myriad of testimonies, Brady supporters were outside, some wearing "Free Brady" T-shirts. At least until the rains came, that is. "I did not delegate my disciplinary authority to Mr. Vincent; I concurred in his recommendation and authorized him to communicate to Mr. Brady the discipline imposed under my authority as Commissioner," Goodell said in his letter to the union on June 2. "The identity of the person who signed the disciplinary letter is irrelevant." Vincent has issued several fines and penalties for various infractions since replacing Ray Anderson as the NFL's executive vice president of football operations in March 2014. The NFLPA didn't question Vincent's authority in those incidents, but it only gets involved when players are disciplined. If Brady's suspension isn't overturned, the battle could end up going to court.